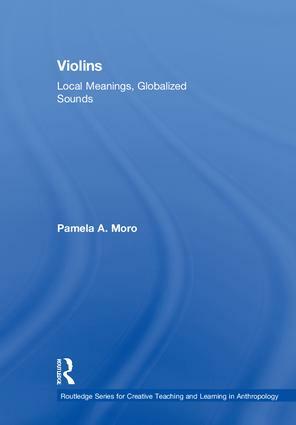 Violins: Local Meanings, Globalized Sounds examines the violin as an object of meaning in a variety of cultural and historical contexts, and as a vehicle for introducing anthropological issues. Each chapter highlights concepts as taught in lower-level anthropology courses, and includes teaching and learning tools. Chapters range from a memoir-like social biography of a single instrument to explorations of violins in relation to technology, labor, the environment, migration, globalization, childhood, cultural understandings of talent and virtuosity, and prestige. Pamela A. Moro is Professor of Anthropology at Willamette University. Her previous work includes Magic, Witchcraft, and Religion: A Reader in the Anthropology of Religion (NinthEdition, McGraw-Hill, 2013). This series is dedicated to innovative, unconventional ways to connect undergraduate students and their lived concerns about our social world to the power of social science ideas and evidence. We seek to publish titles that use anthropology to help students understand how they benefit from exposing their own lives and activities to the power of anthropological thought and analysis. Our goal is to help spark social science imaginations and, in doing so, open new avenues for meaningful thought and action. Focus on specific problems or issues (e.g. social inequality, violence, gender discrimination, consumption, environmental degradation, urban mobility, etc.). Use close description and analysis of everyday objects to stimulate students to think about their own culture and their place in it. Make complex concepts (e.g. capitalism, the nature of hegemony, commodification, etc.) accessible to undergraduate readers. Integrate a set of learning and teaching tools that could include the use of field research projects, group projects, media analysis, films, web-based research, and other relevant activities. Focus on specific problems or issues (e.g., the health care debate, school violence, environmental activism, historic preservation, gender inequality, intellectual property, equity and social justice movements, food justice, rights of marginalized groups, etc.). Help students understand how concepts such as citizenship, engagement, public participation, collaboration, activism, etc. are constructed and mobilized in specific political and social contexts. Examine how anthropology’s concepts, methodological tools, and ethical principles relate to strategic and effective engagement with public concerns and dilemmas. If you have a proposal that you believe would fit into the series in one of its three project areas, or if you have any questions about the series, please contact Richard Robbins at richard.robbins@plattsburgh.edu, or Luis Vivanco at lvivanco@uvm.edu.